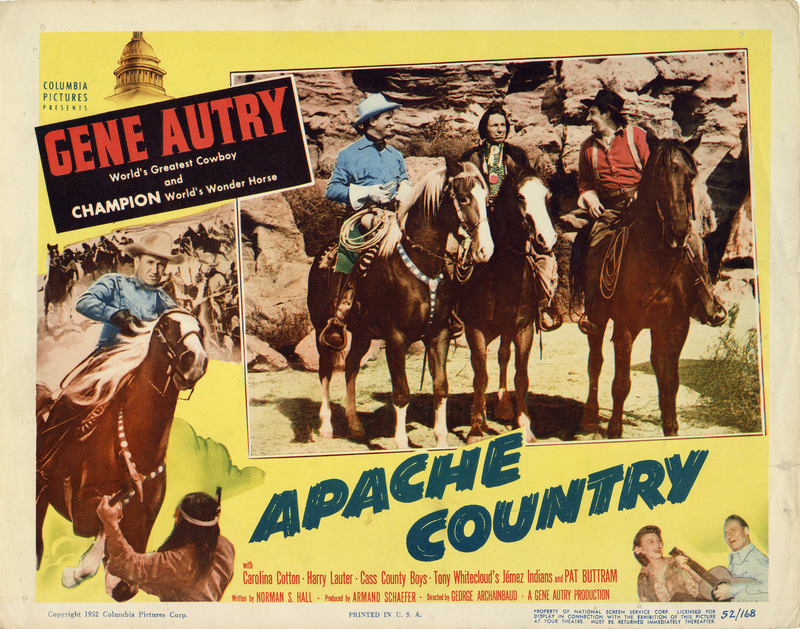 SCVHistory.com LW3224 | Melody Ranch | Lobby Card: Gene Autry Stars in 'Apache Country' (Columbia 1952). Columbia Pictures didn't see fit to give Iron Eyes Cody a screen credit, but it nonetheless used him to advertise its 1952 feature, "Apache Country." He's in the middle, flanked by Gene Autry and Pat Buttram. "Apache Country" was filmed on location at Ernie Hickson's Placeritos Ranch (aka Monogram Ranch) in Placerita Canyon one year before Autry bought the place and renamed it Melody Ranch. Ken Maynard's brother, stuntman Kermit Maynard, also makes an uncredited appearance in this film. The Cass County Boys provide music, and Tony Whitecloud's Jemez Indians dance. Made by Gene Autry Productions (Armand Schaefer, producer) while Autry was under contract with Columbia, "Apache Country" was directed by George Archainbaud, written by Norman S. Hall, and features Autry and his horse Champion with Buttram, Carolina Cotton, Harry Lauter, Mary Scott, Sydney Mason, Francis X. Bushman, Gregg Barton, Tom London, Byron Foulger, Frank Matts and Mickey Simpson. LW3224: 9600 dpi jpeg from original photograph purchased by Leon Worden.